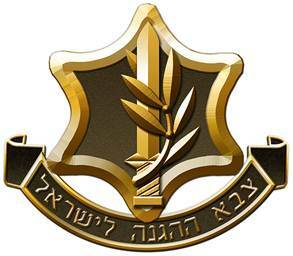 After close to 20 years of guiding in Israel and many years of study and research, I decided to try to share some of the knowledge and insight that I have acquired. 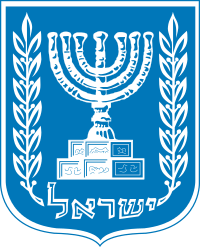 This blog will be about the history of Israel and related subjects. At one point in my career, I was fortunate to be guiding busloads of British tourists to Jerusalem, on a regular basis. In the first few tours I quickly learnt that there are 3 topics that are taboo in polite conversation: RELIGION – POLITICS – and … 'FOOTBALL'. But quite honestly… in ISRAEL … what else is there to talk about ? Therefore; let me state from the outset, that what I write is without prejudice and with much affection to those who cross borders, oceans and international skies for whatever reason, to visit this old/new country, that I call home. The "book of books" - THE BIBLE - is the best seller of all times and has historically influenced humanity more than any other book. Judaism is based on the Old Testament; Christianity is based on both the Old and the New Testament (which evolved from the former); and even the Koran, the Muslim holy book, is rooted in the Old Testament. Despite the fact that the bible plays a role in the lives of billions of people worldwide, most have never been to the land of Israel, and are not familiar with its landscape, the nature, nor its climate . Yet one of the key factors to understanding biblical context is to understand the conditions and natural environment of the land at that time. During the 'Old Testament' period and even up to not that long ago, most people lived off the land, and therefore biblical stories and parables evolved around farm life and nature. If we bring the geopolitical element into the natural setting of the time ; using some knowledge of biblical terminology, we are able to construe with greater clarity, the events of that period. Following is an example of how that formula actually works. One of the most important trees that the Land of Israel is blessed with, is the olive tree. Today, it is common around the Mediterranean and other locations where there is suitable climate, but it was domesticated in the Middle East. The fruit of the olive tree has made a significant contribution to Israel's economy throughout history. The tree itself is very hardy and can withstand extensive damage, either by nature or man, and still recover. This is why the olive tree has come to symbolize stability. Olive trees, Garden of Gethsemane. The olive is mentioned endless times in the bible. One of the most famous references is in the story of the flood in the book of Genesis, when Noah sends a dove to check if the flood has stopped and it returns with a freshly plucked olive leaf . "Shal" from the root word "shalom" in Hebrew, which also means 'peace' was the biblical term used to indicate that the flood had subsided. Therefore, a dove with a branch of olives is indicative of an international symbol of peace. The most important thing about the olive tree is the olive itself and it can definitely be considered a 'multi-functional' fruit. Olives are food… we eat them. At social gatherings, what is a martini without an olive ? Take the olives, crush them and extract oil from them. Extraction is the process of separating the oil from the other fruit content. 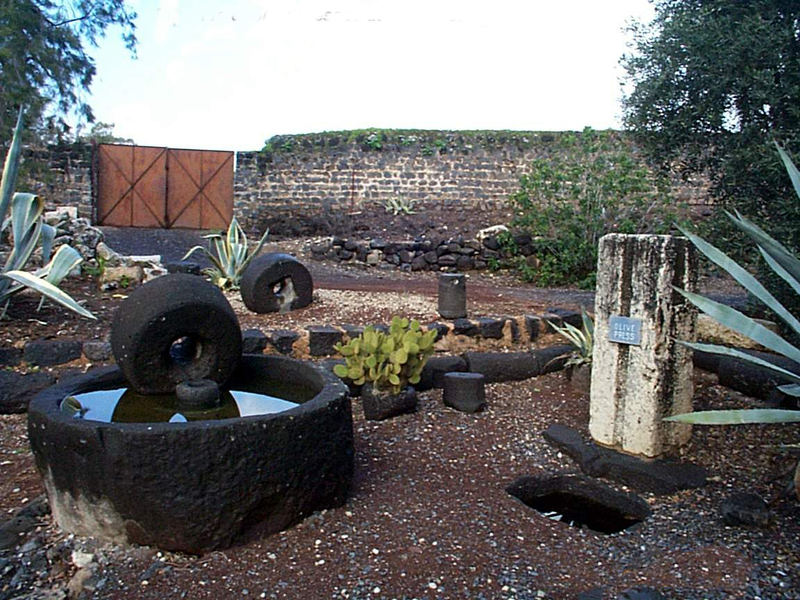 Of course, modern day facilities for oil extraction from olives exist but one can still find oil presses that are thousands of years old throughout Israel. In the time of the bible, a slice of bread dipped in olive oil and vinegar was a meal. Olive oil is one of the best oils that exists. It is known as an excellent antioxidant, it lowers cholesterol levels and is rich in monounsaturated fat (the good kind of fat). According to some medical experts its properties help protect against heart disease, aid in digestion, and are known to promote healthy aging. For thousands of years, people have used olive oil in cosmetics and high quality soaps. 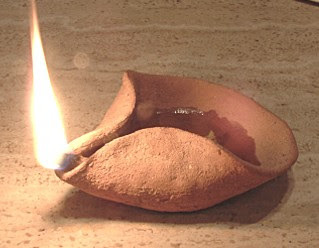 And, a small ceramic container filled with olive oil and a wick, provided light. In the temple of Jerusalem, the 7 branched candelabra or menorah was lit with olive oil. Usually the lowest grade of olive oil was used for light, but ancient Jewish documents describe that in the temple, only the highest quality oil was used for the Menorah. But probably, one of the lesser talked about uses of olive oil in the modern world is the one that in the ancient world was of critical consequence. The exact recipe can be found in the bible (Exodus 30:23). Take olive oil, mix it with perfume and smear this mixture over the head of a monarch. We call this practice "ANOINTING. Young David, for example, is anointed this way by the prophet Samuel in Bethlehem (1st Samual 16:13) "Then Samuel took the horn of oil and anointed him (David) in the midst of his brothers; and the Spirit of the Lord came upon David from that day forward." And, Solomon was anointed at the Gihon Spring (1st King 1:39). "Then Zadok the priest took a horn of oil from the tabernacle and anointed Solomon. And they blew the horn, and all the people said 'Long live King Solomon"
The Hebrew word "Messiah" translates into English as "Anointed One" and translates into Greek as "Christos". When the term "Messiah" was used, it fundamentally meant a ruler. Two thousand years ago this refers to a political leader, who would lead the people to freedom from the Roman occupation. The spiritual and social connotation of the word 'Messiah' was not separate. Thus one can get an idea of how the terminology and nature give background to the political environment of the times.